Are you worried your child is getting a little too much screen time and not enough learning and sunshine? There are too many days I worry about that. I need to make a conscious effort to get them outdoors. "OK you guys, get outside!" Sometimes, kids need motivation and a real life rescue dog like Lucky can help. Lucky is the TurfMutt, a dog who was rescued from the side of a busy highway. Now living in a happy home, Lucky is “pawing it forward” by inspiring children to care for green spaces while learning science. And your child can join the TurfMutt on his mission to save the planet, one yard at a time. 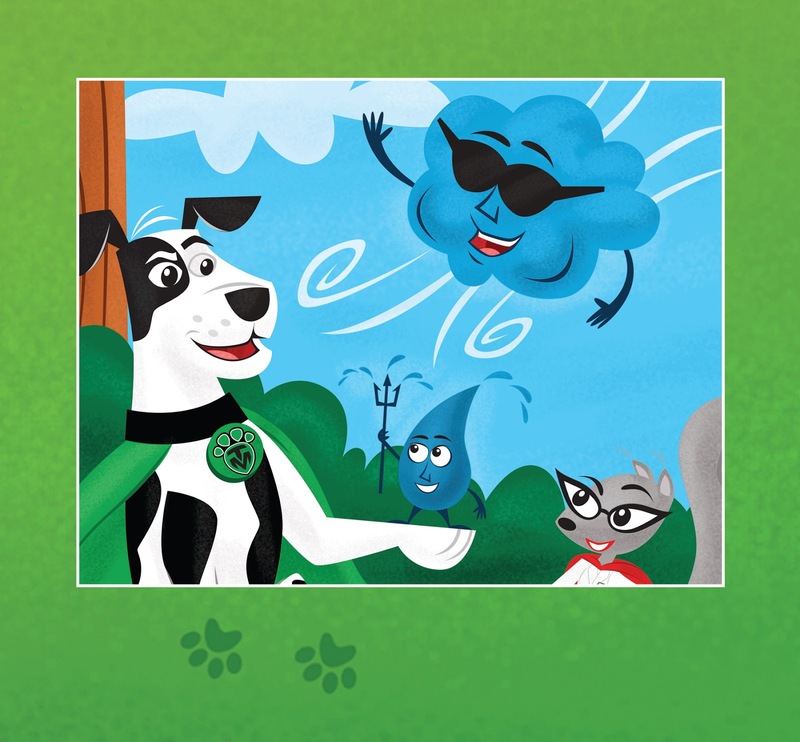 Designed for children in grades K-5, the TurfMutt environmental stewardship and education program uses a unique cartoon-based story-telling format to make science accessible, entertaining and engaging for children and their families. Scholastic Education, the world’s largest education provider, has brought Lucky and his team of cartoon superheroes, known as “The Outdoor Powers” to more than 1 million children in 35,000 classrooms and more than half a million teachers. The Outdoor Powers, which include Green Ranger, Professor Botany, Water Warrior, the Oxygenator, and Big Rooty, help TurfMutt fight environmental villains like Carbon Creep, Dust Demon, Dr. Runoff, and Heat Freak. TurfMutt and his friends invite children to join them on their adventures and chip in to become good environmental stewards. The program website, www.TurfMutt.com, offers take-home sheets and learning activities for families, interactive games for children, and a digital storybook. An online writing tool also helps children create their own stories. Parents, teachers and homeschoolers can also download lesson plans. Videos offer tips on going green and a blog shares advice weekly on how improve your yard. In the backyard science activities, kids can explore how grass keeps water and air clean and the planet cooler, how plants make rivers and lakes healthier, and how grass helps to prevent water pollution. The program’s materials are free and aligned to Science, Technology, Engineering and Math (STEM) standards for grades K to 5. They’re also tons of fun! Liam Ellis, of Sewickley, Pa., recently won the TurfMutt “Be a Backyard Superhero” Contest with a story about TurfMutt. “I thought it would be a cool thing to do a comic strip because I enjoy reading those. It was pretty fun,” said Ellis. Funded and managed by the Outdoor Power Equipment Institute’s (OPEI) Research and Education Foundation, the TurfMutt program has been applauded by educators, youth and families. Since its inception in 2009, the program has reached 38 million students, teachers and families and is listed as a resource on the websites of the Environmental Protection Agency, the U.S. Department of Energy, the Outdoors Alliance for Kids, the Center for Green Schools, and many others. My kids loved the activity sheets and hearing about Lucky! It has been a wonderful experience and adventure so far and we can't wait to continue.